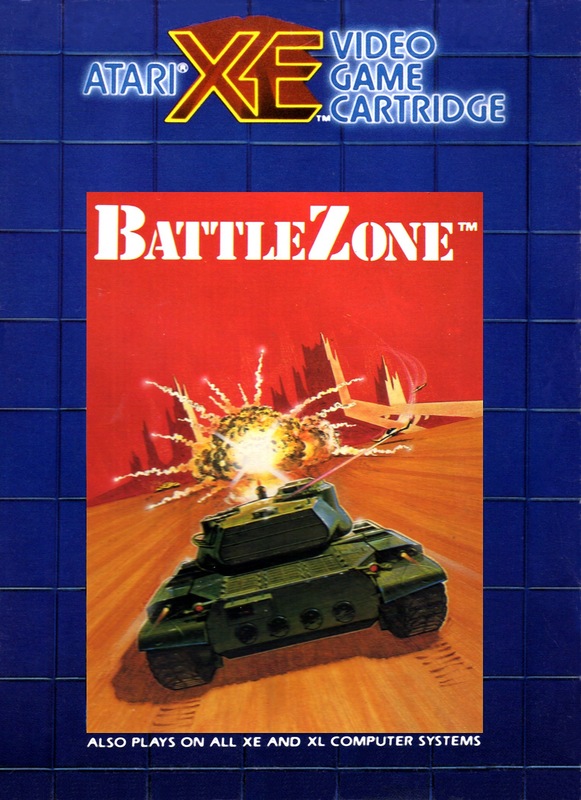 Released by Atari back in November 1980 and created by Ed Rotberg, Battlezone was a first person shooter that put you in the driving seat of a tank where you could roam the landscape to seek out and destroy other tanks. Remembering the game as a teenager, it was awkward to play and I frequently kept getting blown up but this is one game I often played at my local arcade and took quite a lot of cash off me. 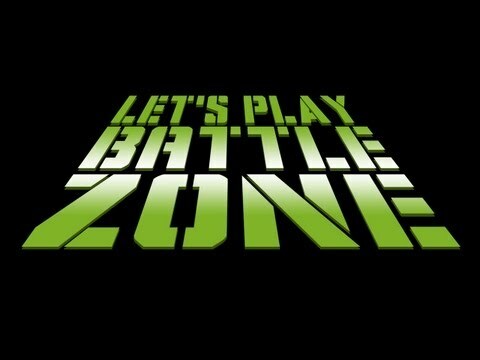 Battlezone was one of the first three dimentional games. It was similar to Asteroids in the respect that it used vector graphics rather than the conventional raster graphics. 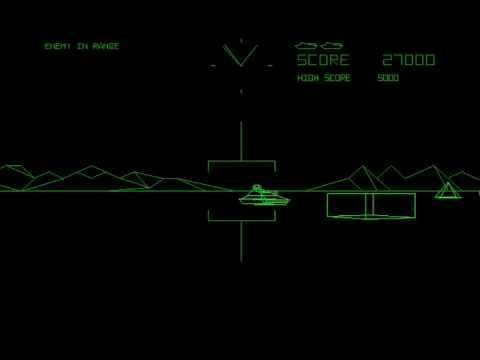 Using only two colours, green vector lines on a black back ground tied in with great sound effects, this gave the game a somewhat realistic feeling of actually batteling in a tank at night time. 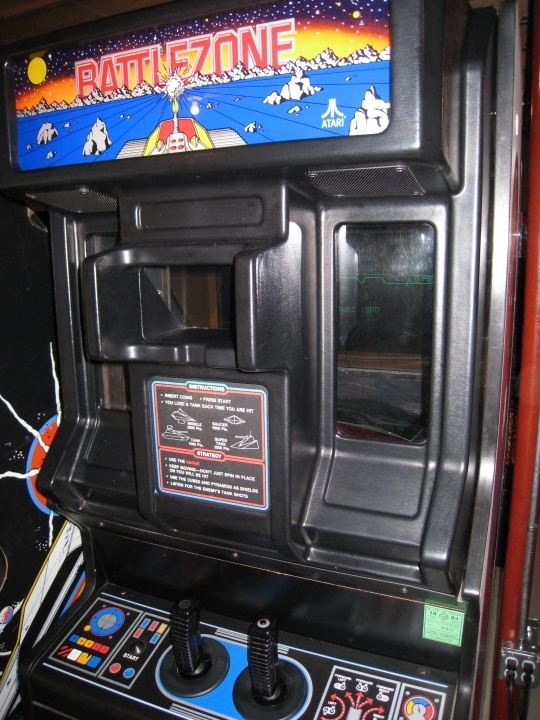 Battlezone was distibuted to the acrades in upright cabinets like many of the arcade games of the time, but for this game the cabinets were altered to incorporated a type of periscope in the middle but set back from the screen. This gave the player an extra dimension to the game but still allowed spectators to view the gameplay from the sides. In later versions the periscope was removed from the cabinet and a type of cross-hair was intergrated into the programming to feature on the screen, this made for more accurate shooting and allowed a wider audience of people to play the game such as youngsters who was not tall enough to reach the periscope. Battlezone also boasted two controllers, this feature gave you a more realistic feeling of driving a tank. These came in the form of a left and right hand controller that intern controlled the tracks on each side of the tank. If you push the left control forward and you would turn right, right forward and you turn left, push left forward and right back and you turn right on the spot, and vice versa. Push both controls forward and you go forward, and both controls back for reverse. In game the player is placed on what appears to be a fairly barron planet surrounded by a mountainous landscape, erupting volcano’s and a cresent shaped moon in the distance, up close you have objects such as Blocks and Pyramid type shapes that you can move around. To the top of the screen is your radar, this is used to seek and destroy various enemies. These range from slow moving tanks and faster faster moving supertanks. What isn’t shown by the radar are guided missiles and U.F.O’s, these can be shot down for extra points. A great tip is to use the Blocks and Pyramids as they cannot be destroyed and are an ideal place to hide behind. If your lucky and you can get behind a block with no tanks on radar, sometimes the next tank will appear directly infront of you. It will home in whilst firing then it will ram the block or pyramid. When it realises it cannot destroy you it will either turn left or right to try and get at you, this is a perfect time to simply reverse back turn left or right to get him in your sights and destroy him. A standard enemy tank is worth 1,000 points. A flying saucer 5,000 points. An extra life is awarded when the player’s score reaches 15,000 points. An additional tank is awarded at 10.000 points. With Battlezone becoming widly successful, Atarisoft ported the game to many home consoles and computers around 1983. The original PC was quite close to the arcade version, the graphics and movement were sufficient but the game lacked sound effects during gameplay. Over the years, many up-dated version are now available such as Theater O Pain and Battlezone – Close Encounter of the Red Kind. The Apple II was similar in it resembled the arcade game but the graphics were low-res and the system struggled to move objects and scroll scenery around the screen, the sound effect were also quite weak. On the Atari 2600 version the game was viewed from a different angle which was from behind the gun turret. The graphics on the Atari were also solid as opposed to using vectors, this was mainly due to the consoles limitations but despite this it was still great to play. The Commodore Vic 20 version was pretty good despite the systems memory limitations. To get round this the game was distributed on cartridge only, the graphics were fairly basic but quite smooth and had great sound effects. The Commodore 64 version was similar to the Vic 20 with slightly better graphics and sound effects. Other versions for the 64 were Tank Atak by Super Soft & Stellar 7 by U.S.Gold. Stellar 7 was a really good version that played very well, it also featured a host of different craft to boost the gameplay like the Sandsled, Laser Tank, Heavy Tank, Hovercraft, Prowler & Stalker but there were also flying craft like the Laser Battery, Pulsar, Skimmer and Seeker. With brilliant graphics and great sound, this is the one to go for. Obviously the game was released for the Atari computer range which was cartridge based and played on the Atari 400, 800 & XEGS computers. Again this was a great version with good graphics and sound effects being very similar to the Commodore 64. Atari 5200 was in the pipeline but was later cancelled. The Atari Lynx version was released in 1994 called Battlezone 2000. This played quite fast with objects and scrolling moving fairly smoothly, it also featured title music (a version of Tchaikovsky’s 1812 Overture) and selectable power-up settings at the start of the game, here you could vary the levels of Fuel, Ammo, Missiles, and sheilds you had to suit your gameplay. For many systems that Atarisoft never ported the game to a number of clones were readily available, these were for systems like the BBC and Acorn computers by the software company Dynabyte called 3d Tank Zone. The 48K ZX Spectrum followed suit. These were Rommel’s revenge by Design Software, 3D Tank Duel by Realtime Software Ltd, Combat Zone by Artic Software and probably the best version was actually called Battlezone, by written for Quicksilva. This was available on cassette and ROM cartridge. Other sytems include the TRS-80 Colour Computer, Apple Macintosh, , Commodore Amiga, Atari ST and the Amstrad CPC. Even newer updated versions of the game are still available on the Nintendo 64, X-Box, Playstation Portable, Apollo Domain/OS and X Window System and Java. Most of the up-dated games however have been completely re-worked like the Battlezone mod3 for instance. This places you inside a large city where you can roam around to track down and destroy enemy tanks, to be honest you can blow almost anything up that you can see. The game also features up to 5 currently available maps such as Ensk, Himmelsdorf, Ruinberg, Lakeville and Siegfried Line. The Nintedo 64 version called Rise of the Black Dogs and gives you a lot more variation. Featuring a comprehensive set of missions, different planets to fight on such as Mars, Titas and Uranus, Deathmatch mode In four player. Pilot and Commander modes were the player is responsible for constructing a base and can issue orders to fellow units. There was a myth amongst players in the early days that you could drive you tank to the erupting volcano in the background and within the crater was a hidden castle. These rumours were obvously false, but plans to have one inserted into future version were inspired by this. A similar rumour was that if you managed to drive your tank in forwad in a straight line without gertting killed you would eventually reach the mountain range where you would discover a tank factory producing enemy tanks. Another was that if enough UFO’s were destoyed a mothership would appear and start attacking, you don’t get this often in moredn games. What really intruges me is that in in December 1980 a version of battlezone called The Bradley Trainer was designed for use by the U.S. and is considered the first VR training device used by the U.S. Army. This was a difficult subject to deal with and was very close to never being produced as some of Atari’ developers refused to work on the project because of its association with the Army. Only two are known to have been produced; one was delivered to the Army and is now presumed lost and the other is believed to be in the private collection of a guy called Scott Evans (lucky man). I find this quite unbelievable or was kama very much looking down on him that day as this guy Scott Evans actually found this hardware dumped in a skip at the rear parking lot at Midway Games. I just can’t get my head round that one! This gunner yoke was based on the Bradley Fighting Vehicle control and was then later re-used in the popular arcade Star Wars game. On August 30, 1985, a Guinness World Record was achieved in Auburn, California by David Palmer where he scored a massive 23,000,000 points while playing Battlezone at The Game Room arcade in Citrus Heights, California. I have to take my hat of to him as after taking an incredible 23 hours David then quit with still four tanks left. He also holds world records in a number of other first-person simulator-type games, namely Red Baron, Star Wars, The Empire Strikes Back, Star Rider, Firefox, SubRoc-3D and TX-1. Its for reasons like these that I have an unquenchable thirst for gaming. Not only do these games hold many historical facts but could it be possible that the pure fabric of gaming actually has an influence on our history. It only takes a small change to have a large impact on not just who we are but on what is to become. This era of gaming unfortunately just doesn’t really exist anymore.